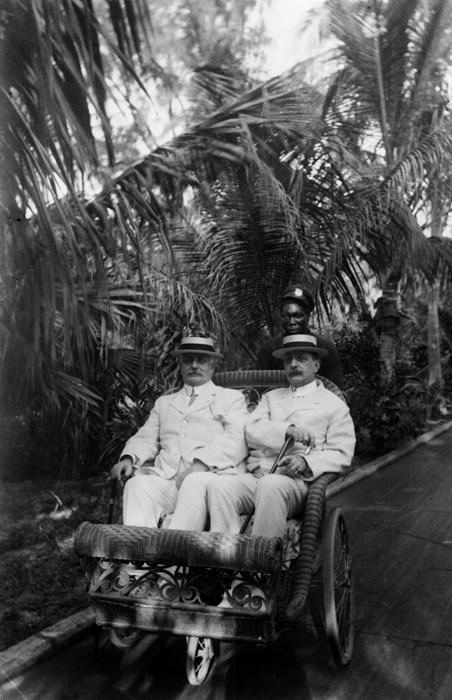 Cass Gilbert with Frank W. Woolworth in Palm Beach, Florida, March 1911, Photograph by Metcalfe, Collection of the Supreme Court of the United States. 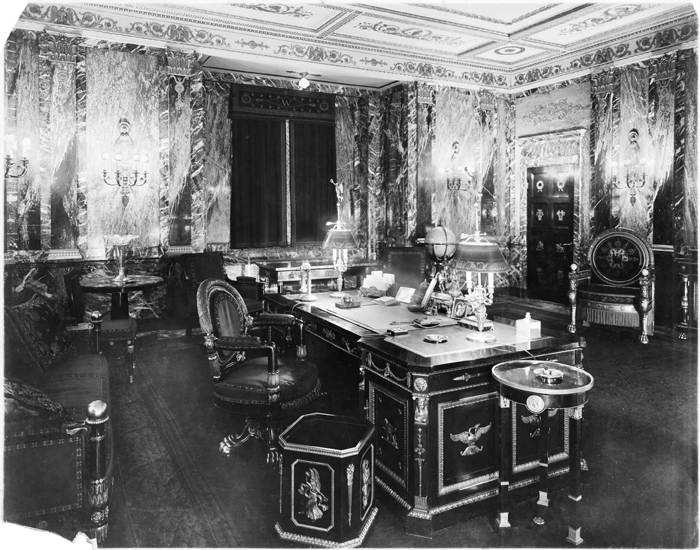 Frank W. Woolworth's executive office, known as the Empire Room, located on the 24th story, Gift of Andrew Alpern. When Frank W. Woolworth initiated his building project in 1910, he was 58 years old and one of America’s wealthiest men. He had made his fortune as a retail innovator who showcased new types of consumer goods at bargain prices on the main streets of American towns and cities. Over three decades, he grew his chain of five- and ten-cent stores from his first successful venture in Lancaster, Pennsylvania in 1879, into an empire of nearly 300 stores in all parts of the United States and England, with annual sales of $26 million. In April 1911, just before the steel frame of his skyscraper began to rise, Woolworth negotiated a corporate merger, and in December established the new F. W. Woolworth Company as a $65 million stock corporation with 605 stores. Woolworth idolized and perhaps identified with Napoleon Bonaparte, whom he referred to as a “wonderful businessman” and “originator in nearly everything.” He collected Napoleonic memorabilia and decorated his new 24th-floor executive headquarters––which he proudly called the “handsomest office of any corporation in this country and possibly the world”––with items from his trove, including a life-sized portrait of the Emperor in his coronation robes, a bust of Napoleon as Julius Caesar, and a clock purported to have been given to Napoleon by Czar Alexander I of Russia. Woolworth and his architect Cass Gilbert were both self-made men, and they became friends. Gilbert had pursued Woolworth, asking for the opportunity to present ideas for “a big structure,” and after several meetings, he received the commission in April 1910. Although some conflicts arose with the imperious Woolworth, who oversaw and often second-guessed every aspect of the project, Gilbert gave the millionaire his endless attention, including inviting him to join the family vacation at a Florida resort. 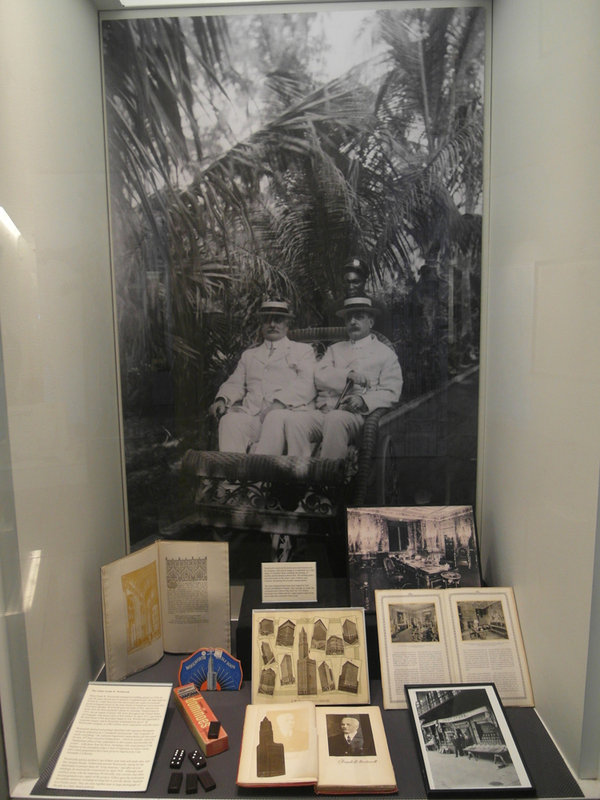 They are seen together here in large photograph of the pair in a Palm Beach pedicab.